Where a pergola forms part of a leisure area, it will be located to take advantage of mild weather, & may have deciduous vines to provide summer shade. These starting ideas may also apply to verandah design, but as verandahs provide protection from the weather, it is less likely to be about transition space and more about providing for all-weather outdoor leisure & entertaining, often as an extension to an indoor living area. The forms & styles of pergolas & verandahs are many & varied, but these will be refined & eliminated as the design develops from the starting idea(s) through to the final design. The influences on design development are the same as, or very similar to those listed in our Deck Projects page. In particular exposure to the weather and architectural style of the home. See our Design Plans page for ideas and plans to provide inspiration for your new pergola or verandah. There is widespread misuse of the word "pergola". We are often called to quote for a pergola, when the Client really wants a verandah. The distinction between the two is very important, as they have specific meanings under the Building Act, with different regulations applicable. An alfresco or outdoor room is a more substantial or robust looking verandah, and is often an integrated part of a home's fabric, with 1 or 2 walls missing. A pergola will be built where exposure to, or partial control only of, the weather is desirable. It may also be built where weather exposure does not impact it's use. For example as an architectural device to improve a facade, as a garden arbour, or to add definition to a transitory space. On the other hand, verandahs are used in situations requiring full weather protection. 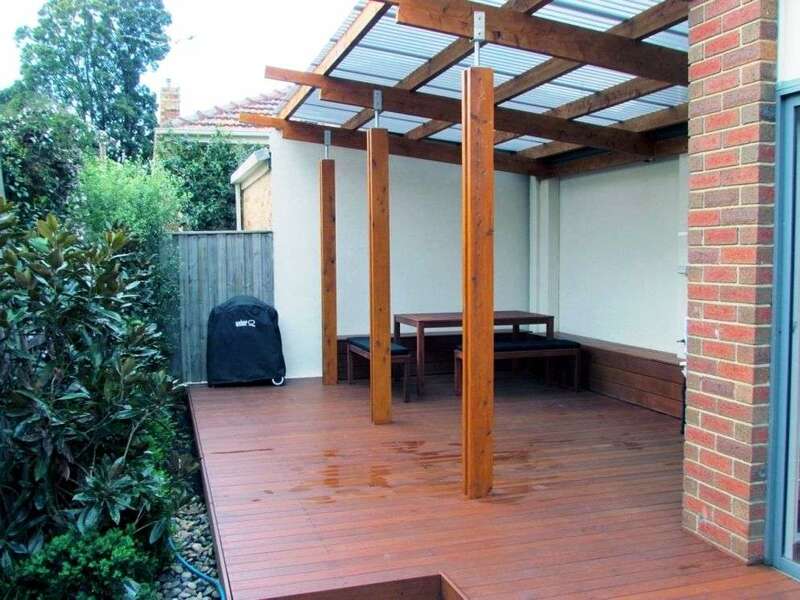 A pergola and verandah combination can provide the most interesting architectural solution. A verandah has to be designed to resist the impact of wind uplift forces, so the footings are usually more substantial than those for decks. A pergola that may have a roof added in the future has to be designed as if it was a verandah. The publication, "Carports & Pergolas Design & Construction Manual" is a good starting point for building a DIY pergola or verandah. Posts of minimum size 115x115 are preferred, even though in many applications, 90x90 would be structurally suitable. This gives the structure a more robust appearance. We embed our posts into the footing and apply a termite & waterproof coating to the embedded section. Embedding the posts into deep footings does away with the requirement for cross-bracing, provided certain criteria are met. We use pre-primed finger-jointed, laminated, H3 LOSP treated pine posts for most of our balcony, verandah, pergola, carport & gazebo projects. These are expensive, but the best performing posts available. Defects under long term performance such as twisting, bowing or splitting are minimal, if any. The smooth finish is ideal for painting. If posts are to be stained for a natural timber colour, to say match a deck, remanufactured merbau posts are a good choice, provided the in-ground section is suitably treated. For framing requiring a painted finish, we use pre-primed finger-jointed, laminated H3 LOSP treated pine. This enables greater accuracy in work, compared with the commonly used laser-cut treated pine. Its smooth, pre-primed finish provides for a superior end finish. For framing that is to be stained a natural timber colour, we mostly use Monterey Cypress (cupressus macrocarpa) a timber sourced from redundant farm trees. This timber is superior to the common cypress pine (callitris glaucophylla) used as framing. Other options, where superior finish & performance are required, are available such as laminated kiln-dried cypress pine or merbau. We will never use proprietary fixing brackets (such as joist hangers) in our verandahs or pergolas. Tiles are not often selected, except where it is the most appropriate material to match a homes style, for example an edwardian home. 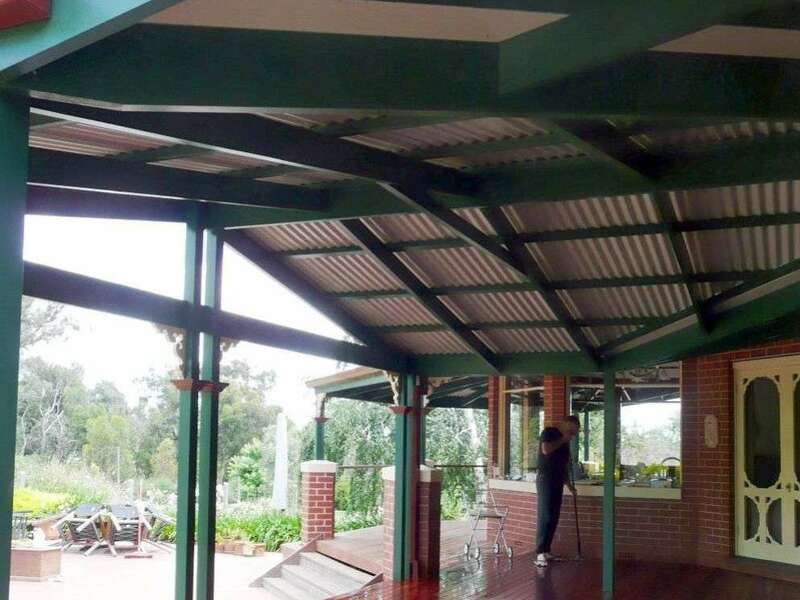 Colorbond sheet roofing is appropriate for the traditional Australian verandah, where escape from our harsh climate is a priority. Care has to be taken to avoid the effects of radiant heat. Often pre-primed pine lining boards are used as a ceiling. Polycarbonate corrugated sheeting (eg. "Ampelite") is used where access to natural light is important, & comes in different grades with improving thermal performance the higher the grade (& cost). Multicell polycarbonate sheeting (eg. "Makrolon") is the top of the range product. It is a flat sheet, set into aluminium channels with seals. It avoids the "dark stripe" effect of overlapping corrugated sheeting, & the panel module is coordinated with the roof framing to produce a streamlined, modern look. It has excellent thermal performance, but the system comes at a very high price.